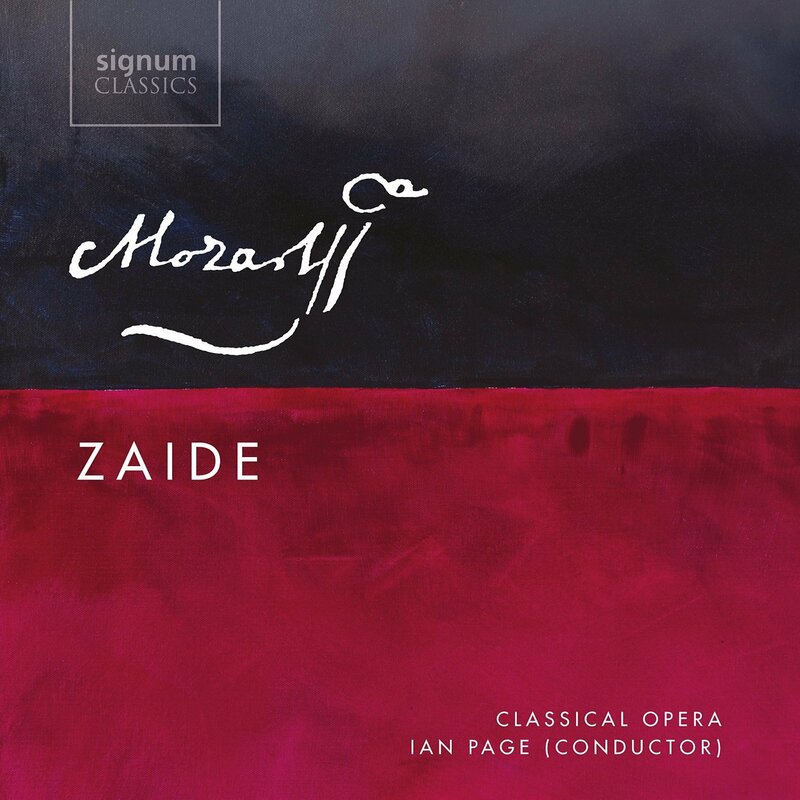 Ian Page and Classical Opera have reached Mozart's unfinished singspiel Zaide in their survey of the composer's operas on Signum. Ian Page conducts a strong cast with Sophie Bevan as Zaide, Allan Clayton as Gomatz, Jacques Imbrailo as Allazim, Stuart Jackson as Sultan Soliman and Darren Jeffery as Osmin. Mozart began work on Zaide in 1779, four years after his previous opera Il re pastore. If completed, Zaide would arguably have been Mozart's first mature opera, in fact he laid aside composition to concentrate on the commission for Munich which would become Idomeneo (premiered in 1781). 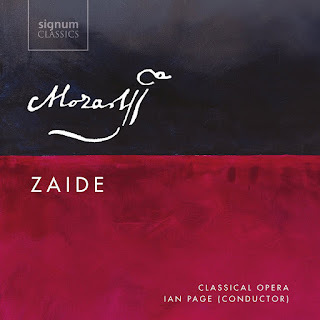 Zaide was written speculatively, to see if Mozart could get interest from the new German opera company which Emperor Joseph had founded in Vienna, hence the rather unusual decision to write a serious opera in German. It is clear that Mozart's operatic music had made a considerable leap since Il re pastore, and though incomplete the opera really impresses with the sheer sophistication of the writing, particularly the use of the orchestra. Mozart did think of returning to Zaide after Idomeneo, once he had moved to Vienna, but he realised that Viennese audiences wanted something a bit lighter and the result was an entirely new piece, Die Entführung aus dem Serail. Zaide has a similar setting to this latter piece, and similar concerns with a female slave (Zaide) and her lover (Gomertz) keen to escape from the Sultan. But here there are no comic characters, and concerns are intensely serious, as befits a work whose origins lie in Voltaire's play Zaire. The libretto for Zaide does not survive, so we have no idea how the missing final act would have played out, the surviving second act ends with Zaide, and Gomertz recaptured after trying to escape and threatened with execution. No doubt the piece would have ended happily, but it seems unlikely that Mozart and his librettist Johann Andreas Schachtner were planning to use Voltaire's twist of having Zaide and Gomertz turn out to be brother and sister, with the guard who helped them, Allazim, being their father. Lacking all this, we must simply enjoy the music and there is much to enjoy. As with previous titles in this series we can appreciate the care and attention which Ian Page and Classical Opera bring to the music, with finely shaped melodic lines, and attention to detail and clarity of texture in Mozart's fine orchestrations. Sophie Bevan as Zaide gets the best known numbers, she floats a line beautifully in 'Rühe sanft', providing just the right amount of edge whilst giving a lovely freedom to the upper line. In Act Two she has a pair of arias in succession (something that Mozart would repeat with Konstanze in Die Entführung aus dem Serail). The first is not uncomplicated and sung in a finely poised, whilst the second is more dramatic, sturm and drang with a fine sense of drama from Bevan. This is highly sophisticated music and writing without commission, Mozart was clearly asking a lot from his leading lady; Bevan does not disappoint and provides a highly rewarding performance. Allan Clayton as Gomatz is introduced to the listener via one of the opera's novelties, a melodrama. Mozart gives us nearly seven minutes of what is effectively orchestrally accompanied recitative, with the vocal part spoken and the orchestra in the main punctuating rather than accompanying. Though Mozart would use a spoken role in Die Entführung aus dem Serail, he never seems to have repeated the melodrama experiment, though here Clayton and Page really make it work as an expressive device. In his first aria, 'Rase, Schicksal, wüste immer' Clayton virile and vivid, in a busy vocal part which he sings with admirably clarity combined with a nice spinto edge to the heroics. It is a fascinatingly characterful piece, you feel that Gomatz has rather more gumption than his counterpart Belmonte in Die Entführung aus dem Serail. In the second aria Clayton is again characterful and virile, though occasionally I could have wished for a little more lyrical ease. His duet with Bevan is delightful, full of charm and yet shot through with character too. Jacques Imbrailo plays Allazim, the guard who helps Zaide and Gomertz. In Act One, Imbrailo gives an involving and engaging performance, making Allazim highly sympathetic, whilst in Act Two he sounds slightly more constrained by the low tessitura, but nonetheless makes a strong impression making you wonder how the character was going to develop. The Sultan is no two dimensional baddie, and we are introduced to him in the second of the melodramas, a highly dramatic piece where the Sultan (Stuart Jackson) reacts to the news that his beloved slave Zaide has fled. His subsequent aria is a dramatic, highly virtuoso piece which Jackson sings with a fine confidence, the slightest hint of strain but with a vivid sense of the words. His second aria is full of angry heroics, but with moments of quiet reflection too. The Sultan's overseer Osmin (Darren Jeffery) is a jolly soul and his single aria is a great delight, with its laughing phrases. Jonathan McGovern makes a strong showing in the small role of the Vorsinger in the opening chorus. Each act ends with an ensemble, a trio for Zaide, Gomertz and Allazim in Act One, and a quartet for Zaide, Gomatz, Soliman and Allazim, giving a hint of what Mozart would go on to achieve in this form with his subsequent operas. As the work lacks an overture, Ian Page starts things off with the Entr'acte from Thamos, König in Agypten which Mozart wrote at the same time. You can't but help but be frustrated by the incompleteness of this work, and in the theatre most companies add extra music to make the piece work. But here Page and his performers give a finely satisfying account of the torso. They combine poised performance with a sense of drama and giving such a strong sense of the mature Mozart in the music and bringing out the deep seriousness and underlying tragedy of the piece (so much so, that you cannot help wonder what was going to happen next). All in all a highly satisfying release.